Vanessa Hua's debut collection, Deceit and Other Possibilities, won the 2015 Willow Books Literary Award and was published in September 2016. She has two novels forthcoming from Random House's Ballantine imprint. A columnist for the San Francisco Chronicle, Hua is also a former staff writer there and has filed stories from Burma, China, Ecuador, Panama, and South Korea. Her work has appeared in The New York Times, The Atlantic, The Washington Post, Guernica, ZYZZYVA, and elsewhere. Hua received a 2015 Rona Jaffe Foundation Writers' Award and was a 2013-2014 Steinbeck Fellow at San Jose State University. She lives with her husband and twin boys in the San Francisco Bay Area. In a conversation with Lisa L. Lewis, Hua talks about the theme of deceit, her experience with small-press publication contests, and the risks of writing about cultures other than one's own. Lisa L. Lewis: In the acknowledgments section of your debut collection, Deceit and Other Possibilities, you describe your stories as being like the rings on a tree, marking many of the significant events of your life. Can you elaborate? Vanessa Hua: These stories were written over a period of time from 2000 to 2014; each one reflects what I was thinking and what my preoccupations were at that point. There aren't many children in this collection. When I was writing many of the stories, I knew I wanted children someday, but I was concerned that my identity would be lost. Although there are parental figures in the stories, the focus is on the relationship from the point of view of the child, even in the story of an adult son and his parents. The first two stories in the collection and the final one were written during the time when I was pregnant and then a new mother. With "Line, Please" and "The Older the Ginger," I thought about the sacrifices that mothers make, including the decision to send your son across the ocean, knowing he'll have a better life. LLL: The title of your collection, Deceit and Other Possibilities, plays off the title of one of your stories but also seems an apt way to describe the entire collection. At what point did you realize that your stories were thematically linked by the concept of deceit and of characters betraying the ones they love? VH: When I looked at the stories, it was interesting to realize that the theme of deceit and how it pertains to immigrant sacrifice had emerged. "The Responsibility of Deceit" was the very first story I wrote, and I almost considered using the title for the collection, as well. 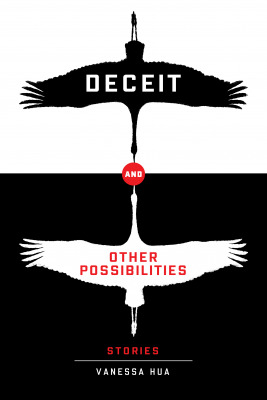 At one point, I was talking with my mother-in-law, running various title possibilities by her, and she repeated one of them back incorrectly: I'd suggested "Deceit and Other Stories," and she said she liked "Deceit and Other Possibilities." I realized it captured the duality of whether characters might think deceit is necessary to keep up family harmony or if it's just self-deception and justification. "Deceit" has a negative connotation, but "possibilities" has a positive connotation. I think the title also conveys that deceit is a possibility as valid as any other. LLL: You've described your work as being about immigration and identity and also as being about "model minorities behaving badly." To what extent does this reflect your own experience as the daughter of Chinese immigrants? VH: I grew up a filial daughter: I studied hard, I went to Stanford, I checked off those boxes, although my parents never pressured me to become a scientist or engineer or doctor. I think they were progressive in a way even though they were traditional. Their job was work, and my job was school. As I became an adult, I was able to share more of my American life with them, but I didn't have the experience where my mom is my best friend. The other aspect with immigrants is the stories that are left behind, either because they're too painful or because of cultural barriers. When I was in my 20s, I asked my grandmother if she'd had any siblings, and she told me she'd had a brother and a sister, and they were both lost during the war. And that was all she told me. Regardless of whether you're from an immigrant family or not, your parents' lives before you arrived are a mystery. That's what drives me as a journalist and as a writer—trying to close those gaps in understanding with an empathetic eye and an open heart. Empathy and sympathy are not the same: I want to portray my characters in all their complexity, including their most desperate moments and all their flaws. LLL: Although the characters in your stories are from a variety of immigrant cultures, there's a commonality to both the cultural and generational conflicts they face. Can you talk about this and also about some of the potential risks in writing about other cultures? VH: For much of my life, I've been thinking about immigration and identity. Someone once asked me, "Who do you read from the Asian American canon?" I said I feel a connection with immigrant writers and the children of immigrants, not just Asian authors. I read writers like Yiyun Li, Daniel Alarcón, Edwidge Danticat, and Junot Díaz because it's compelling to me to explore their characters finding their way in the world. With my stories [the ones set in other immigrant cultures], I asked friends from those communities to read them and give me their assessment. When you choose to write outside your own experience, you need to approach the process from a place of humbleness rather than assumptions. I also want to make clear that my characters aren't meant to reflect an entire community and shouldn't be read that way. Communities aren't monoliths, and people aren't monoliths. Also, characters shouldn't be metaphorical tools to represent a point you're trying to make. LLL: Your story collection won the 2015 Willow Books Literature Award, which included a book contract. Why did you decide to pursue the contest route to publication? What was the process like? VH: At a certain point, I'd accumulated enough stories to have them be considered a collection. I started sending it out to short story collection contests, which seemed to be the route with the most opportunity. My understanding was that literary agents aren't particularly interested in short story collections, and publishers are less likely to take that risk unless you're a more proven quantity with a novel or it's a publishing deal that also includes a novel. I think that's why these small presses fill this niche. I submitted the collection maybe a dozen times over five years, and, then, last year, I entered in the Willow Books contest. It was very exciting when it won! LLL: You're a former staff writer for the San Francisco Chronicle and returned there earlier this year as a weekly columnist. Does it feel like you've come full circle? Also, can you share some background on how the column came about? VH: When Jon Carroll retired [from the Chronicle], the paper decided to open up the spot to rotating regular columnists. The call for applications was last December. I pitched a column about parenting and race and ethnicity, which is what I'm concerned and passionate about. The same week my novel sold in April, I was at my very first residency at Hedgebrook, and my cell phone rang with a familiar prefix (777). It was the features editor who was calling me for an interview. Recently, a friend of mine was at an Al-Anon meeting and told me someone brought my column and started reading it and saying how much she loved it and could relate to it. They say print is dying, but it still has the power to reach people and touch people. LLL: This has been a busy year for you: in addition to your column and your story collection, you also signed a two-book deal earlier this year, and your twin boys recently started kindergarten. What's it like to be at this point? VH: In January of 2016, I signed with my co-agents, Emma Sweeney and Margaret Sutherland Brown, to represent my novel. I did two rounds of revisions, and they sent it out in April when a number of publishers expressed interest. I landed a two-book deal at Ballantine. Although I'd labored over my writing for years, when things happen, they can happen quickly. I feel extremely fortunate. I think being a mom helps me stay grounded. At the end of the day, my sons' needs are still very important. That said, I feel like I'm at capacity a lot right now: it's the perfect storm of a book launch and the kids starting kindergarten. I try to remember to be kind to myself. LLL: How do you mentally toggle between fiction and nonfiction writing? And how do you find time for both? VH: I tend to set aside time for each. Mornings are for essays, and afternoons are for fiction. They require different kinds of thinking: some columns require reporting, while fiction requires you to be in the quiet head space of yourself and the world you've created. I also have an app that converts PDF to voice, so when I was writing the novel, I could listen to it while I was running. And I've been so trained as a newspaper reporter that the last hour before the babysitter leaves is the most productive hour of the day!